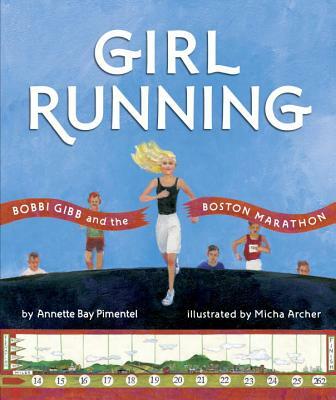 The inspiring story of the first female to run the Boston Marathon comes to life in stunningly vivid collage illustrations. Because Bobbi Gibb is a girl, she's not allowed to run on her school's track team. But after school, no one can stop her--and she's free to run endless miles to her heart's content. She is told no yet again when she tries to enter the Boston Marathon in 1966, because the officials claim that it's a man's race and that women are just not capable of running such a long distance. So what does Bobbi do? She bravely sets out to prove the naysayers wrong and show the world just what a girl can do. Annette Bay Pimentel loves true stories about real people. She also wrote the picture book Mountain Chef: How One Man Lost His Groceries, Changed His Plans, and Helped Cook Up the National Park Service. She spends her days reading nonfiction picture books and reviewing them on her website, researching in libraries, and writing about the people she discovers. Micha Archer wrote and illustrated Daniel Finds a Poem, and has also illustrated several books for educational presses, including The Wise Fool and Lola's Fandango. Working in collage and oil, her use of color and pattern is influenced by the folk art, crafts, and architecture of the countries she has visited and lived in. She realized the importance of the book as a teaching tool after teaching kindergarten and raising two children. Micha divides her time between Costa Rica and western Massachusetts, where she lives in the house she and her husband built, surrounded by gardens and forest to roam in.